Long-term management of critical water resources infrastructure needs to incorporate projected changes to environmental conditions. Reservoirs form the heart of water resource assets. 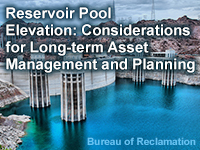 Long-range plans for the repair, replacement, maintenance and renovation of these facilities depend on accurate projections of reservoir pool elevations. Environmental conditions, in turn, dictate the magnitude and timing of inflows and outflows from reservoirs, and thus the resulting water surface elevation. This lesson explores the factors that affect reservoir pool elevation and the considerations and challenges that changing reservoir pool elevations pose to managing existing water resources infrastructure. If your looking for something to help you sleep, this is it. I find the subjects interesting. Easy to understand lessons which solidify a strong basis of reservoir awareness. Great interactions keep you alert and attentive. Instructive imagery, clear text. Would have liked some animations or video/audio, but overall great! Describe key features of projected temperature changes in for the Western United States (mean annual temperature, seasonality). Describe the key features of projected changes to precipitation for the Western United States (amount, phase, timing, intra-year and inter-annual variability).